Eye Pop Art on the cover of the Crafts Report! 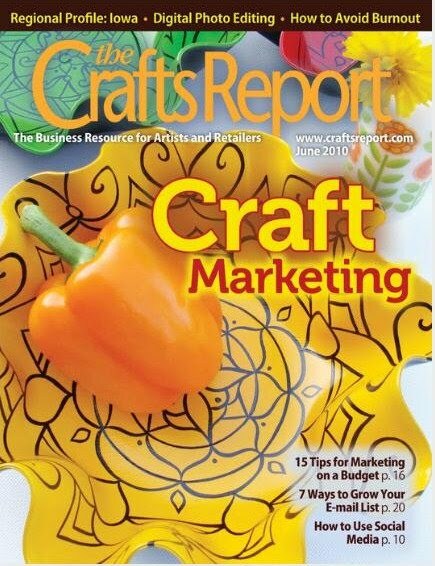 It's June, and Eye Pop Art is on the cover of the June issue of the Crafts Report! You can read the article online here. It's called "Make More Money with Social Media" by Megy Karydes, and it starts on page 10. I haven't received a printed copy yet - do you get this magazine? Do you read it? I'm really curious to see if this will bring new business or other opportunities. Whether it does or not, I'm pretty happy (thrilled, in fact!) about the great exposure for my business. It's kind of fun, too! Read the article to learn about my husband, "a punk rocker and songwriter," my psychedelic home and mandala tattoos, the help I've received from Trillium Artisans and my love of Etsy, the "huge lifesaver." As the title of the article implies, it also talks about how I use social media to market my business. I mention that blogging takes a lot of time to come up with interesting content to write! Sorry, people who like to read blogs. It's true, I really do prefer the immediacy of twitter and facebook. So, if you aren't already, why don't you check out my facebook page, and follow me on twitter? Here's a couple screenshots of the awesome, colorful layout of this article. I love how they used the record player image for the lead-in, and then used lots of my colorful photos throughout two two-page spreads. It's total eye candy! I love my life! 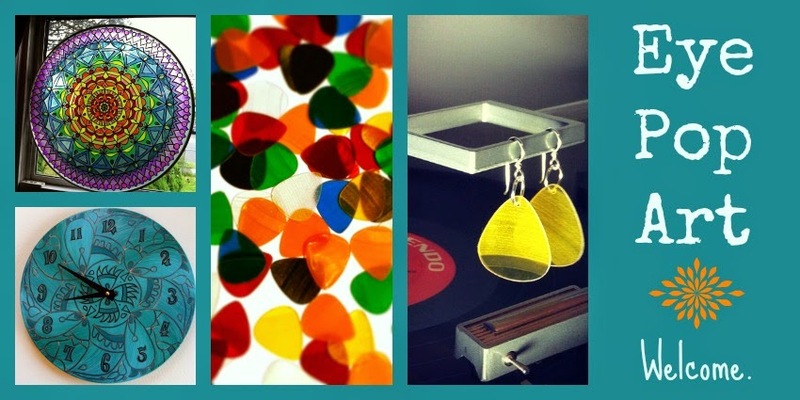 To order any of the groovy items you see here, or make a custom request, please visit my shop at http://eyepopart.etsy.com. Thank you!